The day started with the first part of session Communication and Education in Geoscience: Practice, Research and Reflection (EOS4.1) convended by Sam Illingworth who is - among other things - the editor of the Copernicus journal Geoscience Communication which is dedicated to the important field of, well, cmmunication efforts in the geosciences. They received so many abstracts for their session that they were given four timeslots for this important topic throughout the day. Rebecca Williams talked about The use of social media in volcano science communication - challenges and opportunities. Although the topic of her talk focused on volcanoes as an example, I think that the use of social media as shown in her presentation is transferable to climate science and therefore from vulcanologists to climate scientists. There‘ll be another section about EOS4.1 below, but - as there‘s just too much interesting „stuff“ going on at the same time at EGU - I left it after this first of four parts to head to the Great Debate The safe operating space for the planet and how to ensure it is not passed. The debate was chaired by Jonathan Bamber and Stefan Rahmstorf and had Prof Myles Allen, Prof. Sabine Fuss, Erica Hope and Prof. Linda Steg on the panel. Each of the panelists gave a short statement about their take on the planetary bounderies to kick things off. After the presentation, Stefan Rahmstorf initiated the debate with 2 questions posed to the panelists. While they were answering the questions, a rather long line of at least a dozen people formed to ask questions of the panelists. Unfortunately, some of the people in the queue were more interested in giving a „co-presentation“ instead of asking a short question and had to be reined in - with mixed results - by Jonathan Bamber. You can watch the recording of the webstream here. 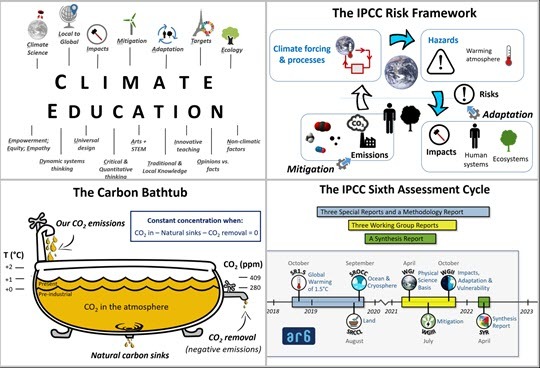 After the lunch-break I joined short course SC2.2 offered by Robin Matthews (IPCC WGI Science Officer) and Cheryl Manning (Science teacher) about Ideas and Resources for Teaching Climate Change. The course was intended for science teachers and educators but many of the suggestions are adaptable for other setttings as well. Robin and Cheryl walked us through various topics in their shared presentation and inbetween had us do some learning activities like matching terms (e.g. 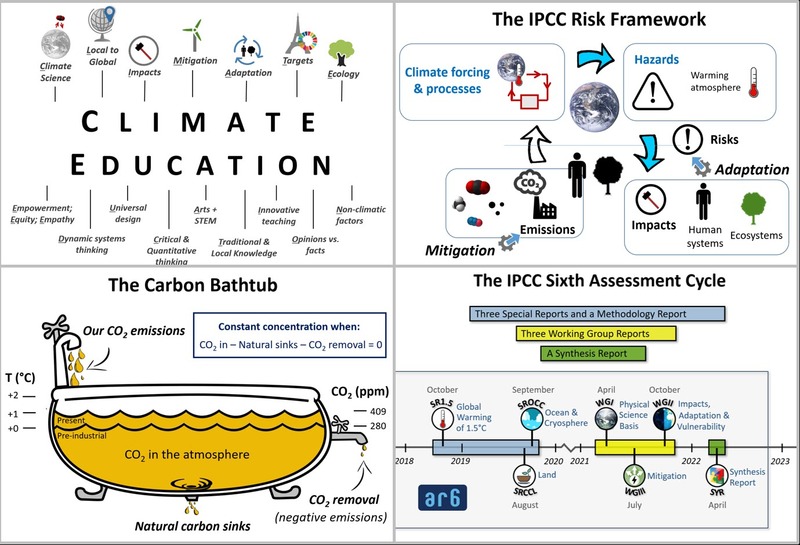 greenhouse effect, rising seas, coastal flooding, relocation, renewable energy) to different categories (climate processes, hazards, impacts, adaptation, mitigation). Robin explained scientific aspects and how the IPCC-reports can become helpful resources for educators, while Cheryl - who is a teacher - shared pointers about how to engage students and get them interested in science. Martin Archer: Physics Research in School Environments: A template programme of deep engagement with schools Materials are available here. Anne Van Loon: Learning by Doing: How Individual Fieldwork Projects Enhance Engagement, Ownership and Learning in Geoscience Education. The highlight of the session was Sergej Lebedev explaining what happens in Ireland with a National-scale engagement of school students using an active research: the SEA-SEIS North Atlantic Expedition’s outreach programme. Students get a chance to virtually accompany scientific expeditions out at sea and interact with the crew and scientists via live video connections.